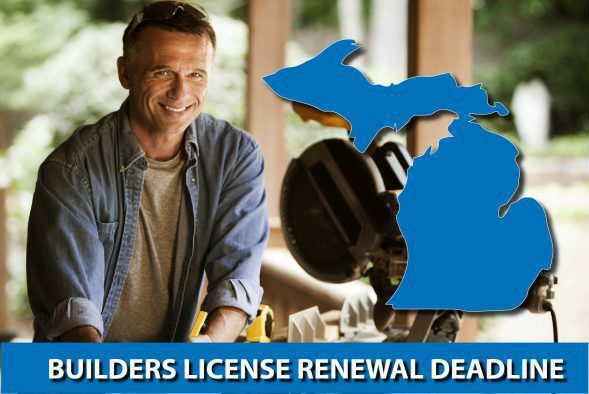 Michigan Builders, The May 31st License Renewal Deadline Is Just Around The Corner! Are you one of the 3,000 Michigan Builders set to renew a license by May 31, 2018? Note: Renewals completed after May 31st but before July 1st will incur an additional $20 late fee. Do you still need your continuing competency? and get 10% off online courses excluding books and book packages. This entry was posted in Construction and tagged Michigan Builder Renewal, Michigan Builders, michigan builders license, Michigan Contractors.